Sponsoring food drives, volunteering at senior care homes and raising money for local charities are just a few examples of what students at Peoria high schools are doing to help their community. 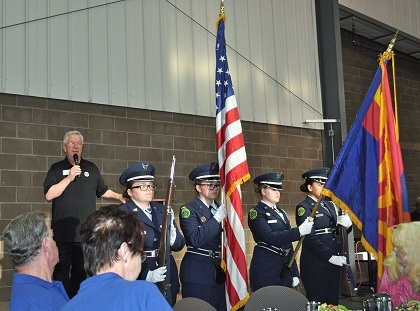 Service clubs from Peoria and Centennial high schools were recognized during the event. Future Farmers of America, ROTC, student council, Rotary Interact Club and DECA were among the more than two dozen service clubs commended for their volunteerism. Banquet emcees were Bob and Rachelle Barrett. Rob is the former mayor of Peoria, while his wife, Rachelle, is a 35-year member of the Peoria Sunset Lions Club. Other dignitaries in attendance included U.S. Rep. Debbie Lesko, Arizona State Sen. Rick Gray, Peoria Unified School District board member Kathy Knecht, Peoria Vice Mayor Mike Finn and Peoria Mayor Pro Tem Vicki Hunt.